This past November, Mars Global Surveyor (MGS), the first US spacecraft to successfully return to Mars since Viking in 1976, stopped transmitting data to Earth after 9 years in orbit exploring Mars. Since two of our more recent retirees played key roles in this success story, I thought that this mission would be of interest to our group as it was to me. The two retirees that helped me with the story of MGS are Bud McAnally and Ray Zercher, both of whom were with the program since the proposal and participated in MGS flight operations. Both retired in 2003. First, a brief description of the background of the Mission and the spacecraft is in order. The first spacecraft that was planned to explore Mars after Viking was Mars Observer (MO), built by General Electric and launched in 1992. MO stopped transmitting 3 days prior to it’s scheduled Mars Orbit Insertion burn. A propulsion system fuel line rupture was suspected as the cause of the failure (Ref.1). After that experience, NASA’s administrator (Dan Goldin) determined that he wanted a faster/better/cheaper approach with less reliance on billion dollar spacecraft like MO ($980M). NASA formulated a new Mars Surveyor program that was designed to inaugurate a new generation of less expensive American space probes to explore Mars every twenty-six months from 1996 to 2005 (Ref 1). MGS was the first spacecraft in that series and was designed to carry five of the seven instruments that were originally on MO. The MGS proposal activity occurred in the spring of 1994. The bidders were Martin Marietta Denver, TRW, and Spectrum Astro. The MMC proposal manager was Ed Dorroh and Bud McAnally joined the team after being selected as Program Manager one week before proposal submittal. Bud remembers that the team had 3 major challenges (at least): 1. MGS had to be launched on a Delta launch vehicle (MO was launched on a Titan III), which severely constrained the weight of the spacecraft (1000Kg vs. 2500Kg for MO); 2. JPL, the managing NASA agent, badly wanted to utilize a spare set of MO avionics but had no spares; 3. NASA did not want a repeat of the MO propulsion failure, which meant proposing a different propulsion system. The orals with JPL were in June 1994 and Bud remembers asking the visiting NASA Source Selection Board (SSB) members to allow the MMC team to depart from standard procedure in answering the SSB questions during the orals. The MMC team wanted to answer the SSB questions out of sequence which was against all MMC lessons learned during previous proposals. The reason was that the team had used a relatively new 3D modeling CAD computer program during the proposal and Al Herzl (the Mechanical lead) had put together a “dynamite” presentation using that tool to answer the later mechanical questions, that in fact allowed the team to put all the other Qs in context. After Al’s presentation, Bud remembers that the SSB attitude changed very favorably and the MMC team got the congratulatory phone call from JPL July 5, 1994. Ray Zercher remembers the design phase of the program being very compressed. Since launch was scheduled for November 1996 the team had just 26 months to complete design, build, and test. Ray was the lead for Power Systems hardware that included the solar arrays. These arrays had to provide the drag to perform the aerobraking maneuvers that would get the spacecraft into the lower Mars orbits required to obtain the imaging resolution required for the mission, as well as provide the power for the spacecraft. Ray remembers that Bud’s direction to allow the engineers to talk together without the leads was key to “solving impossible problems”. Ray also remembers crisp decision making from Bud, even though Bud wasn’t always in agreement with Ray’s recommendations. Bud remembers the solar arrays also had a significant design challenge in that the magnetometer instrument had to be positioned on the end of one of the solar “wings”. The wiring on the array had to be magnetically neutral to allow the magnetometer to function properly. Under Ray’s direction, Khalid Sharmit worked with SpectraLabs to devise a wiring harness that would work. Soon after launch in November 1996, it was discovered that one of the solar arrays had mechanically malfunctioned and couldn’t be positioned as desired for aerobraking. After a successful insertion into Mars orbit on September 12, 1997, revised aerobraking maneuvers started that lasted a year longer than originally planned. This turned out to be a blessing in disguise as the longer durations at lower altitudes provided valuable science opportunities. During its 9 years in Mars orbit, MGS had some notable achievements, summarized here from Ref. 2: “The spacecraft tracked the evolution of a dust storm, gathered information on the Martian terrain, found compelling evidence indicating the presence of liquid water at or near the surface (formally announced by NASA on 22 June 2000), and photographed the infamous "face on Mars" that some believed was an artificial formation…. Mars Global Surveyor also produced the first three-dimensional profiles of Mars's north pole using laser altimeter readings. By mid-2000, the spacecraft had taken tens of thousands of high-resolution photos of the Red Planet.” Ref. 3 contains a good description of the spacecraft itself and its science instruments. 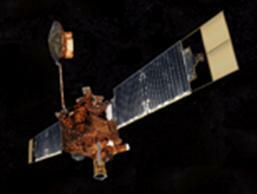 “Mars Global Surveyor, launched in 1996, operated longer at Mars than any other spacecraft in history, and for more than four times as long as the prime mission originally planned. The spacecraft returned detailed information that has overhauled understanding about Mars. Major findings include dramatic evidence that water still flows in short bursts down hillside gullies, and identification of deposits of water-related minerals leading to selection of a Mars rover landing site.” Congratulations MGS team!